Indian Naval Ship (INS) Tabar, a stealth frigate of the Indian Navy entered Port Louis, Mauritius and shall remain there till 13 March 2016. The primary aim of the visit is to participate in the Mauritius National Day celebrations and to strengthen the existing bonds of friendship between the two nations. On the occasion of the National day (12 Mar), the ship would be fielding a marching contingent in addition to fly-past by Chetak helicopter and performance by the Indian Naval Band. India and Mauritius have traditionally enjoyed close and friendly relations. The National Day Celebrations in March 2015 coincided with the Joint Commissioning of MCGS Barracuda by the Prime Ministers of both countries. The Indian Navy also undertakes regular joint exercises with nations in the Indian Ocean and INS Teg had undertaken joint patrolling with Mauritius in July 2015. These joint missions have fostered seamless interoperability between the two maritime nations and have developed a strong friendship and mutual trust that underpin Indo-Mauritian partnership. These visits reinforce the cultural and ethnic ties of the two countries and are testimony to their joint commitment towards maritime security in the region. The present deployment of Tabar for participation in the National Day celebrations of Mauritius will further cement the close relations between the two nations and the two navies. In addition to the National Day celebrations, the experts from ship would also impart harbour training through lectures and demonstrations to the National Coast Guard of Mauritius. The lectures would cover a wide spectrum of maritime activities including anti piracy drills, Visit Board Search and Seizure of ships at sea, use of special equipments and weapons, engineering and preventive maintenance capsules, training on radar, chart plotting, GPS operations for coastal surveillance radar system, damage control and fire fighting. INS Tabar is a state of the art guided missile frigate. 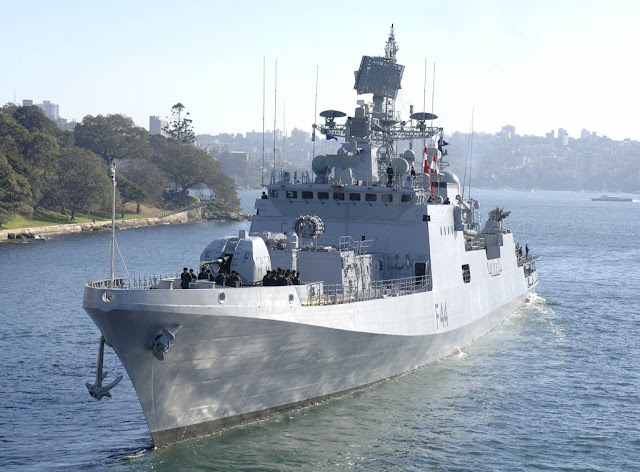 The ship is presently in her eleventh commission and is commanded by Captain Ashutosh Ridhorkar.